By Irvin Air Chute Co., Ontario, Canada. 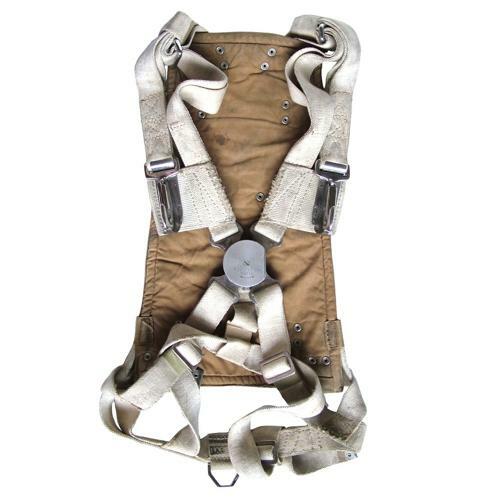 This is a standard 'Observer' harness for use with clip on chest-type parachute packs. Cream/white webbing without a central fleck. It has the typical WW2 Royal Canadian Air Force 'sliced' / non-fully rounded quick release (QR) box. The webbing is stamped with maker's marks and clear April 1943 date and is in very good undamaged condition with light soiling through normal use. The QR box functions correctly and all metalwork is very good. Fitted with a single chromed anchorage 'ring' at the back for securing the airmen in flight. Also comes with a backpad in good used condition (some soiling and light verdigris on press studs). Overall this is a very good to excellent example of these increasingly difficult to find items. The Canadian harnesses are manufactured to the same pattern as standard RAF examples but do not have a central 'fleck' stitched into the webbing and generally have higher quality metal parts. Stock code S22431.